Nestled in the North Carolina High Country of the Blue Ridge Mountains, the town of Jefferson is the heart of Ashe County. As the county seat, it is the hub of government, health care and social services for our 25,000 area residents. It is also the core of tranquility for those who call it home as well as for those who visit. We are a friendly community, welcoming all who choose to absorb our natural beauty and relax in our quiet corner of northwest North Carolina. Our residents enjoy the comfort and security of a small town with easy accessibility to a major university (Appalachian State) and to amenities offered by larger communities in North Carolina, southwest Virginia and east Tennessee. Our public schools are state-of-the-art. Our branch of Wilkes Community College plays a pivotal part in continued education and in the development of a well-trained workforce. We are balanced in our work and recreation. We value the important part small towns play in the economic well-being of our citizens. 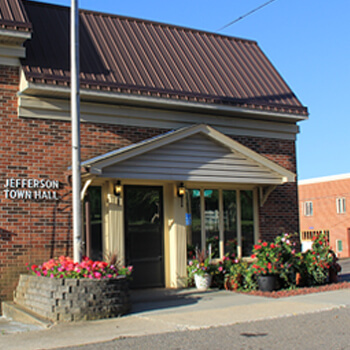 Jefferson is a beautiful blend of tradition and progress: a gateway community to a rich mountain heritage and an extraordinary quality of life. We are the standard-bearer for culture, community and commerce.